Dr. Paresh Doshi is one of the best Neurosurgeons in Mumbai, India and is an expert in Parkinson's disease treatment, Functional Neurosurgery, and Deep Brain Stimulation Surgery. Dr. Doshi has been the Director of the Department of Neurosurgery since 2011 and is in charge of the Stereotactic Biopsy and Functional Neurosurgery program at Jaslok Hospital, which is the only dedicated and complete Stereotactic and Functional Neurosurgical program in India. Under Dr. Doshi's supervision, a multi-subspecialty neurosurgical program has evolved at the Jaslok hospital. 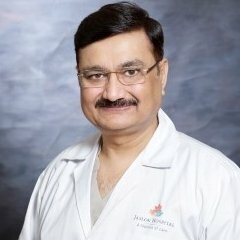 Dr. Doshi has been a pioneer in functional neurosurgery in India, and the DNB Neurosurgery program, under him, trains one neurosurgeon every year. Dr. Doshi has received extensive training in the field of Stereotaxy and Functional Neurosurgery at the most premiere centers in England for a period of 4 years. These include the National hospital for neurology and neurosurgery, Queen-square London Maudsley, Newcastle General Hospital, and King’s College Hospital, London. Dr. Doshi has received further exposure and experience of specific Movement Disorder surgeries in Sweden, USA, Netherlands, France, and Austria. Dr. Paresh Doshi has been invited as CME speaker to talk on Functional Neurosurgery at the prestigious meetings of Neurological Society of India (NSI) in 1996, 2001 and 2004. Indian Academy of Neurology (2002). World society of stereotactic and functional neurosurgery, Toronto, 2011, Asian society of Stereotactic, Functional and computer-assisted neurosurgery. Asian and Pacific Parkinson’s disease surgery association meeting in Hong Kong (2001) and Indian Society of Stereotactic and Functional Neurosurgery (1999, 2000, 01,03 & 04,06,08,09,10,11), and at Congress of Neurological surgeon, USA (2009). • Top Neurosurgeon in Mumbai, India • Functional Neurosurgery expert in Mumbai, India • Over 550 Stereotactic surgeries, including 22 brainstem procedures. • Introduced the technique of stereotactic evacuation of intracerebral hematoma in Mumbai • Dr Paresh Doshi has performed more than 300 movement disorders surgeries. This number is one of the largest in Asia and ranks very high among the leading centers in this field across the globe. • Largest numbers 350 of Deep Brain Stimulation surgeries have also been performed at Jaslok Hospital. • We have also performed all varieties of Epilepsy surgery in India including Lobectomies, Awake craniotomies, corpus callosotomy and lesionectomy. • The spasticity program has been launched in 2004. • Psychiatric Disorder surgery program started in 2009. • He has published >30 research papers in peer reviewed journals and is a reviewer of the esteemed journals. M.Ch: 1992 (First rank), Nair Hospital, Mumbai.